Setting up a massive outdoor soundsystem in the middle of a city and getting away with it is no easy feat these days, especially in the UK, so when FACE/Below pulled off Circoloco in the Arena on a stretch of industrial wasteland in the heart of Birmingham last Easter, they had us impressed to say the least. Moving to the middle of August this year, no doubt in a bid to fend off the unpredictability of Brummie weather, the event is upscaling even further and spreading over two days, teaming up with Type Festival to bring a heavyweight host of house and techno talent to play alongside nearly the whole Circoloco roster — Jamie Jones, Seth Troxler, Kerri Chandler, Davide Squillace, Matthias Tanzmann, Cassy, Shonky and co — plus some high profile house guests in the form of Carl Craig, Levon Vincent, Prosumer, Kim Ann Foxman and Citizen. Once again taking over the multiple spaces of Digbeth's Rainbow Complex — including the Pub, Courtyard and the venue's vast viaduct-lined surrounding area — this year the event's location is also expanding, utilizing The Rainbow Garden and various adjoining streets. Day one will see DC10's Circoloco brand rule the raucous roost, with Seth Troxler headlining the outdoor Arena stage until after dark, while Maceo Plex takes to The Street and ex-Panorama Bar resident Prosumer tops the bill at The Garden. 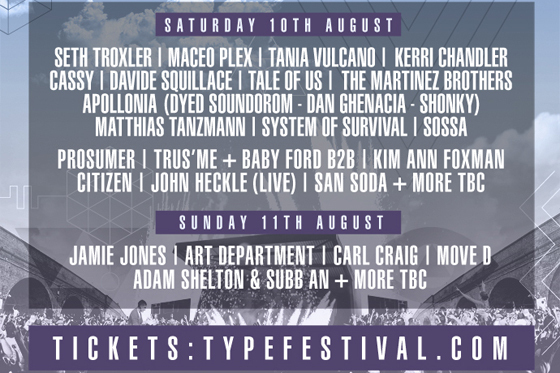 On Sunday, however, it's Type Festival's turn to lead the charge, with Jamie Jones and Carl Craig on the gargantuan main stage (The Arena). With a new ticketing system, extra bars and newly installed viewing platforms, Circoloco in the Arena looks bound to be bigger and better this year, building on the success of an event that saw thousands take to the streets for Birmingham's most epic ever inner city party. The backstreets of Birmingham may be a far cry from gorgeous Balearica, but the vibe shan’t be far off. 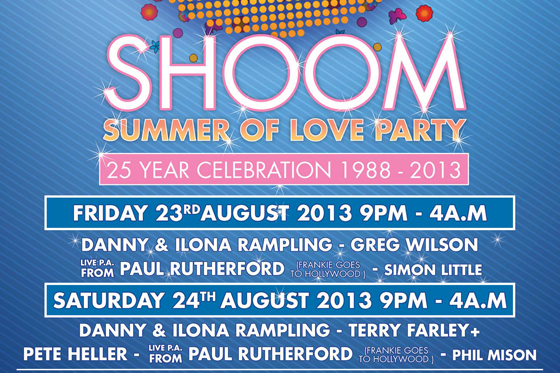 A quarter of a century since it all began, Danny Rampling's Shoom is still feeling the love. If the season he helped set in motion with the inception of his night in the late '80s was dubbed the “second summer of love”, are we now experiencing the “third summer of love”? House heads heading to Hastings on bank holiday weekend might agree when Shoom celebrates its 25th anniversary at West Exit Club this month. Teaming up with his wife, Ilona, to rock the decks, Danny has drawn from the ranks of dance music history for this two-day knees-up on the South East coast of England. Disco boffin Greg Wilson and Junior Boy's Own veterans Terry Farley and Pete Heller are the venerable chaps duly selected to pay homage to the London club night that helped trigger the acid house explosion all those years ago. A live PA from Paul Rutherford (Frankie Goes To Hollywood) will also bring back more than a few fond memories. London's answer to The Warehouse Project returns with another series of nomadic parties powered by the baddest, most bold brands in underground dance music this month. Dubbed the series of events “for a nightclub that doesn't exist”, the launch at — you guessed it — an unannounced London venue presents something of a coup for the capital. Destined to prompt techno purists in The Big Smoke to drool over their original Drexciya “12s, James Ruskin's Blueprint imprint is on call to give Londoners a rarer-than-hen's-teeth live showcase. 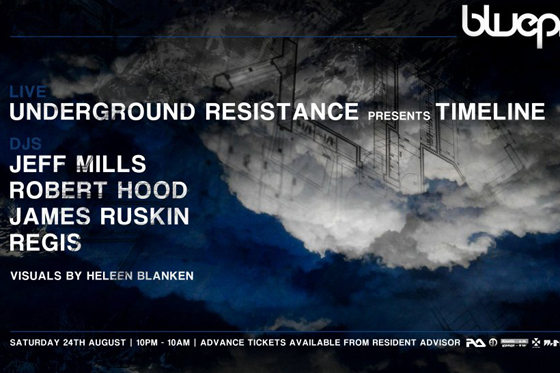 On Saturday 24th August, Mad Mike's genre-defining techno collective Underground Resistance will perform as Timeline, while fellow Detroit second wave pioneers Jeff Mills and Robert Hood also kick off a launch weekend supported by a Running Back showcase featuring Tiger & Woods, Gerd Janson and John Talabot on Sunday. Over the past few years, stylish gastropub The Faversham has served as the choice spot for Leeds' finest summer parties. 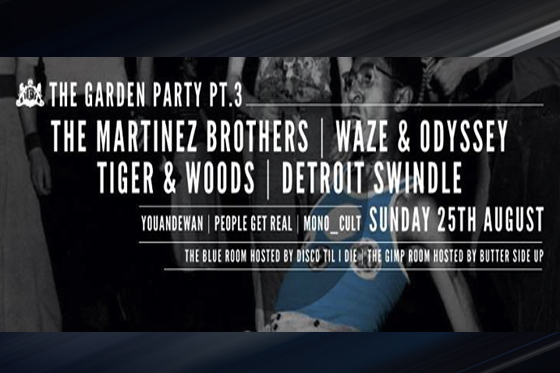 Offering a regular spot for Mono_cult to shake its tail at, Technique & Asylum have also made it their own with their special breed of Garden Party, bringing Art Department, Todd Terje and Paul Woolford to the venue's multiple rooms this time last year. It's not often Londoners get a chance to taste the delights of LA. The UK climate is separated into two seasons — bitterly miserable or miserably bitter — and the chance of seeing a beautiful blonde in a bikini rollerskating down the street is about as likely as Nile Rodgers working with Avicii (hey, wait!?). 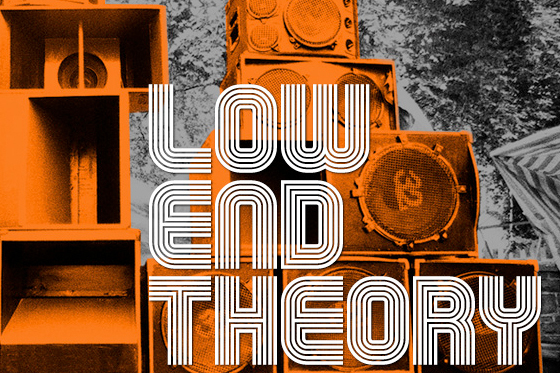 The glamourous superclubs and affluent Hollywood hangouts aside, LA's dance scene is best perhaps defined by the Y3K hip-hop of Low End Theory, Daddy Kev's club night showcasing the likes of Flying Lotus and Gaslamp Killer. Even Thom Yorke once made a DJ appearance. Whenever there is anything slightly alternative or out of the ordinary stepping onto the London club circuit, you can be fairly sure the Soundcrash guys are pulling the strings behind the scenes and, yes, you guessed it, they're responsible for the Low End Theory showcase with Gaslamp Killer, Daddy Kev and DJ Nobody at Village Underground on Friday 16th August.